Start the day as you mean to go on. That’s how I kid myself when I have this raw chocolate smoothie for breakfast anyhow. It’s delicious, healthy and a breeze to make. Perfect for breakfast or a post workout boost. Our supply of raw milk is back and we are stupidly excited about it. We lost it over a year ago when our Cornish food shop closed. We can now buy it again at our local pannier market. This means I am at last able to make raw food smoothies. These feel like a nice healthy start to the day. If you’re vegan or not drinking dairy for whatever reason, you can easily substitute the raw milk for a non-dairy milk of your choice. Almond milk would probably be my preferred one for this raw chocolate smoothie. I add various ingredients to a basic mix, but this one involves an organic raw chocolate and almond spread. This may not be the easiest thing to get hold of, so in the recipe I’ve suggested using raw almond butter instead along with cocoa nibs or raw cacao powder. I’m not too keen on sweet stuff for breakfast, preferring to keep that for later in the day. I find the banana in this raw chocolate smoothie makes it plenty sweet enough for me. CT agrees. But please do add an additional sweetener such as maple syrup, agave nectar or raw honey if you feel the need. This raw chocolate smoothie makes for a nice breakfast treat and a change from our normal toast. 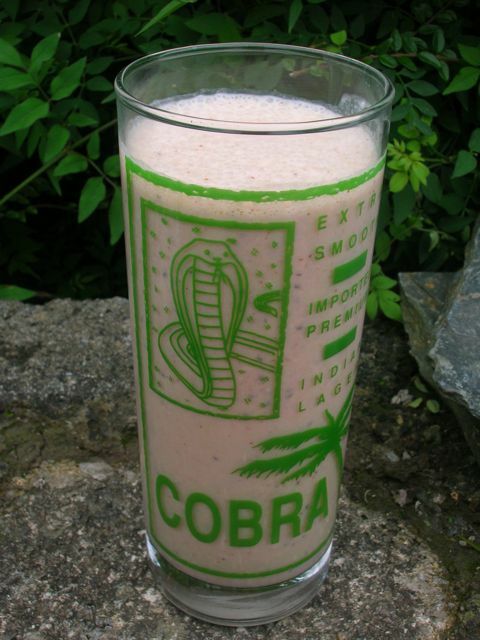 It’s silky smooth, but it won’t bite back, quipped CT as he drank his smoothie from a Cobra glass. If you’d like to find even more smoothie recipes, head over to my Super Smoothies recipe board on Pinterest. You’ll find absolutely loads to choose from there. Thanks for visiting Tin and Thyme. If you make this raw chocolate breakfast smoothie recipe, I’d love to hear about it in the comments below or via social media. Do share photos on your preferred social media site and use the hashtag #tinandthyme, so I can spot them. For more delicious and nutritious recipes, follow me on Twitter, Facebook, Instagram or Pinterest. 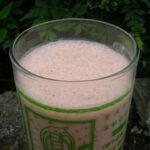 A delicious and healthy smoothie which makes for a perfect start to the day. Place all ingredients in a blender and blitz for a few seconds. A non dairy milk can easily be substituted and additional sweetener such as raw honey, maple syrup or agave nectar can be added if desired. 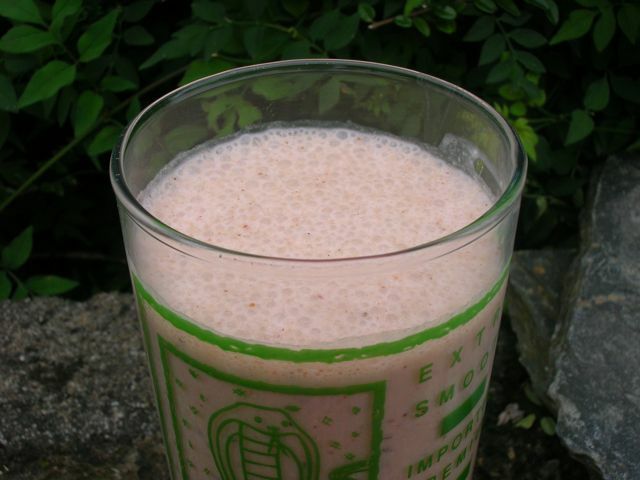 I’m entering this raw chocolate smoothie recipe into Javelin Warrior’s Made with Love Mondays. It may not have taken long to make, but it was certainly made with love. Raw chocolate and hazelnut sounds even better. 750 centilitres is 7.5 litres. I think you mean millilitres. Oops, yes I did, thank you. Thanks Jac, smoothies have become a regular breakfast now, which is funny as we didn’t used to have them at all. Love the header…scrumptuos. Never tried the raw chocolate spread…I must have a look for some. We are emphatically not milk drinkers in this house, but I am all for smoothies! And yes, I want to know more about this raw choc and nut spread, having re-ignited a serious passion for Nutella while on holiday.